Australia seems to have more than its fair share of gritty, independent and determined characters. Perhaps it is a function of the land, which dictates that Australians occupy the periphery, the coastline, leaving the heartland of their country unpopulated. Or maybe it is a result of being alone on the edges of several oceans, distant from any other developed country (with the exception of its distant cousin, New Zealand). Whatever the cause, there is a sense of isolation in Australia that produces men and women who are strong, forthright and resolute. Clyde Campbell is one of them. Although he may have you believe that he is just another one of the "mates" who share a beer or two (or more) after a rough game of rugby, his personal history says otherwise. I met Clyde at a filming of a video to be used to promote his latest passion, the pursuit of a cure for Parkinson's disease, in which he had asked me to play a part. 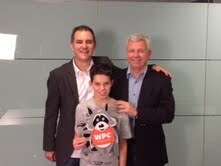 As with most Australians, he was welcoming and personable, sharing his big smile and a strong handshake. Despite his friendliness and the repartee that we shared, he remained focused on the production's agenda for the evening. I quickly realized that whether it was running, skiing, hiking, or spending time with his wife, son, Josh and two daughters, Phoebe and Zoe, he pursued the important things in his life with a driveness that reflected his years of successfully slugging it out in the robotics business. Now 46, Clyde was diagnosed with Parkinson's disease almost 3 years ago. After a short time to process the consequences of the diagnosis, he pinpointed with engineering precision the place to pour any energies and funds not required by his business or family. Consistent with the goal of solving the problem of Parkinson's, he met Michael J Fox, established a liaison with the MJF Foundation, and started his own family foundation, Shake It Up Australia. During the times when neither of us was involved in the taping, we had easy conversation about our common enemy, PD. Although the paths by which we got there were very different, we had a great deal in common and committed to stay in touch. Very different from Clyde, Chris Davis is another of Australia's "everyday heroes". As president of the New South Wales Parkinson's Association, he leads a quiet campaign to improve the lot of those who live with Parkinson's disease. He is accommodating and hospitable (he and his wife, Pam, having put us up in their home for the time we spent in Sydney), while at the same time decidedly committed to wage war on the devastating disease he was diagnosed with some seven years ago. Selflessly and without fanfare, he seeks to marshal the state’s and country's Parkinson's community, promoting cooperation and coordination with all of the key stakeholders. His engineering background has given him a measured and well-designed approach to problem-solving, in addition to his balanced and affable attitude in dealing with the diversity of personalities involved. Although self-employed and working as a part-time water consultant, Chris spent an enormous amount of time planning my visit to Australia, arranging trips to various Parkinson's research facilities, meeting with neurologists and scientists, as well as setting up speaking engagements. Not just arranging, but personally attending these meetings, Chris showed an unrivaled dedication to and support of the "Shake up My World" tour. Lacking any personal credibility in this part of the world, I was accepted by Chris at face value and he promoted my efforts as if they were his own. I gained not just a comrade in arms, but a friend. In Australia they have what is called the tall poppies syndrome. It is the practice of pulling down successful people in Australian society on the basis of some perceived or actual fault or flaw. 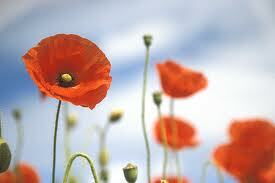 In a society that pulls down the "tall poppies", leadership is undertaken at high risk. However, leadership is essential if society is to address injustice and the needs of the vulnerable. It is through responsible leadership by men like Chris and Clyde that the needs of those facing the challenges of Parkinson's disease are being addressed in Australia. It is through the perseverance of such leaders that we will see a cure for Parkinson's to alleviate suffering by future generations. Arriving in Singapore just 24 hours after leaving a village in northern Thailand left me bewildered and out of sorts. From time to time it has proven difficult to face the need to change our mindset when moving from one stop on our world tour to the next. It has required total immersion in the present situation and avoidance of any comparisons between countries. It is like dealing with the onset of Parkinson's disease. It also demands that one maintain the ability to shift gears and live in the present, sidestepping any comparison with the past and any discouraging anticipation of the future. Despite their differences, in every one of the prior 11 locations we have visited so far (in South America, Africa, the Middle East, and now Asia) there has been evidence of people with Parkinson's having great unmet needs. When it comes to helping people with Parkinson's, there are significant disparities between Canada, as an example, and any of the countries visited thus far. In some ways, arrival in Singapore signaled the end of being confronted daily with the resource differential between the underdeveloped or developing global South and the relatively wealthy "Western culture". While it is somewhat reassuring to know that in my country people struggling with PD have significant resources at hand, there is also a sense of sadness and a sincere desire to somehow address the needs of others. I have come to recognize that the portion of the Parkinson's community that operates in the "have" nations needs to do more to assist those in the "have not" countries. How, I am not exactly sure, but maybe my travels over the past 55 days will provide the necessary context and perspective for change. It appears that the assumption made by the title of my round the world trip ("Shake up My World" tour) has been established. In virtually every place we have visited to date, organizations helping people with Parkinson's, if they exist at all, are struggling. Some of the challenges they face could be better addressed by cooperative resource development. For instance, there seemed to be similar ideas being launched in various locations that could each be improved upon by sharing their experiences. Take, for example, the fact that numerous organizations have pursued dance therapy, speech therapy and tai chi or yoga as a means to assist people with Parkinson's. However, there is little, if any, coordination or sharing of how this is done in order to assist others with the planning and development stages of such programs. Everyone seeking to help can learn from the apparent victory or failure, struggles or successes of other organizations. Instead, many fledgling or newly founded Parkinson's associations, clinicians and therapists "reinvent the wheel" to some greater or lesser extent. There is much that would divide the Parkinson's community including geography, economic realities, language, technology, politics, medical services, and capacity. However, there is a great deal that links us together, including the motor and non-motor symptoms we share, the fears and failures, courage and successes, the longing to find a cure, and the sometimes overwhelming sense of hopelessness, helplessness and fatigue. But if we are to serve the needs of people with Parkinson's around the world, stable bridges between members of our community must be built. This starts with making relationships a priority. It is the people that make the difference. Leaders such as Julie Lau in Singapore, Sarita Sidoti in Argentina, Maria Barretto in India, and Agustin Recabarren in Chile need to know each other. Relationships form the necessary network in which to effectively communicate, cooperate and coordinate with each other. The onus is not on organizations, but on each of us to initiate, facilitate and take responsibility. Here are some things that I've learned from others so far. - We must learn to listen first, and talk. - We must avoid making assumptions, and sincerely seek to understand the needs of others. - We must make it as simple as possible for communication to take place. - We must build on existing relationships and facilitate new ones among individuals, and groups. - We must be able to compromise our own small agendas and take a global perspective. 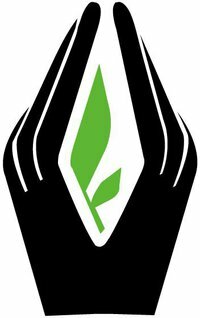 - We must minimize "turf wars" between organizations, as these steal vital resources, energy and community. - We must work hard to agree on how to serve the best interests of people with Parkinson's. - We must be willing to share ideas, experiences, and even resources, and avoid "hoarding" anything that would assist the common cause. - We must be prepared to reach out and seek agreement on common approaches. - We must be secure enough in our respective "calling" to focus on what we do best. - We must avoid at all costs division caused by petty differences, personality conflicts and jurisdictional disputes. - We must work together to serve the global Parkinson's community. These ideas may sound idealistic, but the status quo is not acceptable. We are a community that must recognize its strengths and weaknesses, addressing its needs in the best interests of all, whether prosperous or poor. 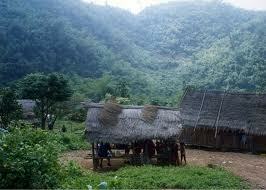 The village was called Huay Kok Muu, and comprised of several hundred people, mostly of the Lahu tribe. 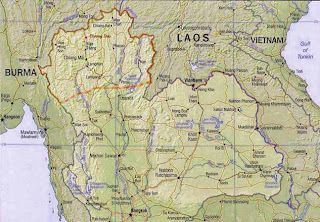 It was some four hours’ drive north of Chiang Mai, and only a few kilometers away from the mountainous Burmese border with Thailand. The small farming community consisted mostly of houses constructed on stilts to avoid water and animals from entering the living space. There were a few Christian churches and a school, but no commercial enterprises except the very small "convenience store" at the corner of what was considered the town’s two major streets. Surprisingly, many of the roads in the community were paved, although this was inconsistent, as were the other two utilities: electricity and water. Some houses had neither. 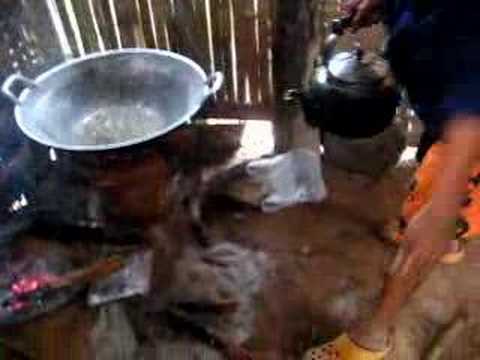 It was like stepping into a documentary giving an inside view of life in rural Thailand. We were privileged to be able to visit this community and stay overnight with relatives of our Thailand hosts, the Jupo family. Despite being halfway around the world from my home, I felt entirely welcome and comfortable regardless of the limited and rustic facilities of the village home where we stayed. The house itself was made up of a large ground floor room and one directly above it connected by a wooden set of stairs. The elderly Jupo parents/grandparents slept on a mattress on the linoleum-covered ground floor, while guests would have mattresses set out on the upper floor. Upstairs windows were simply small window holes with a board to slide in place to keep the heavy rains out. Attached to the main house was a large, covered, but otherwise open, kitchen area with concrete flooring (except for around the cooking fire area where the flooring was compact dirt). Furniture was sparse, with two long tables in the kitchen, around which were placed plastic chairs or stools. A few low "squatting" wooden seats were placed around the two small wood-burning cooking stoves in order to allow someone to sit minding the fires and food. The washroom facilities were considered deluxe compared with most of the neighbors in that there was a three room concrete building that had been constructed to house two small toilet rooms (one with the traditional squatter) both with a half barrel of water and dipper with which to effect a flush. The third room accommodated a shower (cold, naturally). I found that memories of growing up on a farm in an extended family environment with little beyond the bare necessities flooded my thoughts over and over again. I saw, and experienced again, the simple, uncluttered life of family and friends sharing a farm culture that changed very little from year to year. After the Jupo family, Carson and I settled in the second storey room of the elderly Jupo couples' home, we all went out to explore the village, and later the family pineapple field. It was perfect timing for ripe pineapples. 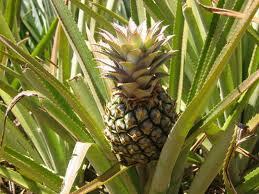 It proved to be the best pineapple I have ever eaten; honey sweet, not woody or acidic. After standing in the field, eating the equivalent of at least two pineapples, we loaded a basket full to add to the fresh-picked bananas, mangoes, lychee, jungle and star fruit we would enjoy later. The passion fruit and other yet to ripen crops would have to wait for another visit. Next, a delightful trip around the village on our host's motor scooter, and gathering chuckling children everywhere I went (as I struggled a little with the gears), I returned for supper. Eating with our hosts' family, we were joined by five or six elders, and some of their spouses, who had been invited to come and share with us their thoughts on leadership and challenges. 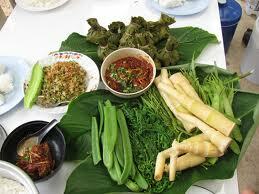 Following a traditional Lahu meal, with fresh fruit, the discussion began. Most of these men were in their 60s or 70s and had, at least at one time, held responsible and respected positions in the village, including some pastors in local churches. The discussion was reserved, respectful and deferential, while at the same time revealing their hearts and their desire to serve their community. To my surprise, one of these gentlemen, a man by the name of Jaseu, age 63, had Parkinson's disease, having been diagnosed five years ago. The gathering seemed genuinely interested as he described his views on the disease, as well as the challenges he had experienced. It was apparent that he did not speak of it often, but he agreed with me when I suggested that it was necessary for us to talk with our friends and family about our PD not only so that they will understand us and the disease better, but so we can feel accepted for who we are, shaking and all. I was pleased to hear that he was able to get medication for Parkinson's, which due to his financial circumstances was provided for free. I was reminded of my lengthy interview the day before with Dr.Rattana Chanchaem, neurologist in Chiang Mai Hospital. She told me of the difficulty that people had of being able to afford the medicine. She also said that there was little in the way of support outside of the hospital, thereby minimizing the kind of therapy that we've seen being carried out by Parkinson's organizations in other countries. She shared her encouragement that a neurologist in Bangkok was trying to start such an organization for Thais, but was unsure of its status or ability to help those in outlying areas like the village. Of course, my first response after experiencing staying at the village overnight was overwhelming appreciation for what I had at home. However, it was not pity that I felt for the villagers, but a deep sense of respect. They worked very hard to maintain what we would consider subsistence living conditions. Like my own parents and grandparents, the villagers tried new ideas, struggled for a better life for their children and were honest and ready to share what they had with others. Certainly, the Lahu community was not a model of economic success, but it was a reminder that the luxuries and distractions offered by the developed world are often worth very little in comparison to the values maintained in humble places such as Huay Kok Muu. One of the problems with traveling around the world is that things can happen at home that are totally out of your control, leaving you feeling helpless. No one in our neighborhood found it the least bit amusing. My daughter's cat with the unlikely name of Gus Gus was perched almost 100 feet (thirty meters) up in the fir tree next to our house. He was announcing his predicament to the world at large, or at least anyone within earshot (especially our extraordinary neighbors). It was readily apparent that Gus Gus had quickly become more than a little unhappy about his improvident decision to flee up the tree away from whatever had been chasing him. Everyone assured my wife that the cat would come down on his own when his hunger eclipsed his fear. So, for the first day or two, my wife, daughter and neighbors patiently awaited the return of silence to our street. Of course, the endless yowling and crying all night long had a proportionate stressful effect on people depending on their proximity to our complaining cat. Our master bedroom was some 30 feet (ten meters) away from the drama. Now, if I had been at home, instead of halfway around the world, I would have taken advantage of my hearing loss and removed my hearing aids at night, thereby enabling a much more restful sleep than my dear, long-suffering wife was able to get. The neighbors came by sometimes several times a day to check on the progress, or lack thereof, in saving Gus Gus. Of course, implicit in these encouraging visits was an increasing perception that the complaints of the cat were being echoed by our neighbors. As the days wore on, the guilt associated with "allowing" a very loud cat to be stuck up high in a tree for all to see and hear made for more sleepless nights and an increasing sense of helplessness. 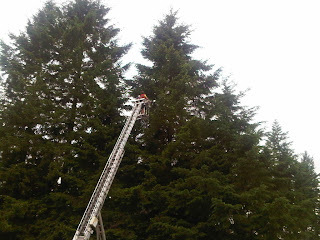 It wasn't as if attempts have not been made to coax or cajole the kitty from the tree top, but nothing seemed to help. A friendly man with a truck-mounted extension ladder tried to help, but the ladder was not long enough. Attempts to Google a meaningful answer proved useless, if somewhat amusing, as the most ferocious debate seem to be between those who believed that cats always come down sooner or later, and those who believed that cats can die up in the tree as they cannot climb down the tree, only up. Of course, many suggestions were made (call the fire department, spread birdseed at the foot of the tree to attract birds to engage the cat's hunting instinct, etc.). However, it appeared that someone, somehow, had to climb up the very bushy tree to the very top in order to retrieve the bawling scaredy-cat. Several phone calls to companies offering bucket lifts with the necessary capability proved fruitless (or ridiculously expensive). By the eighth rainy day it had become apparent that the drenched and frightened Gus Gus was not going to come down on his own. He would either die up there and become a rather unfortunate testament to the fact that cats don't always come down from trees, or fall to his death from his airy perch in hunger and thirst. It further became obvious that the neighborhood’s goodwill had been tested enough as they had become exasperated with the endless howling. After several calls to different tree topping companies, Don agreed to respond to the exasperated pleas of my sleep-deprived wife. Clearing limbs on the way up in order to permit him access to the top of the tree, he finally reached Gus Gus. While my neighbors and family members peered upwards, relieved that success was within reach, the cat did not seem to have the same sense of appreciation for being rescued. After numerous attempts to get a hold of Gus Gus and place him safely in a bag for transport to the ground it was apparent that the delusional cat would not go without a fight. Just when it seemed that the ferocious feline was about to surrender, Gus Gus scrambled even higher up the tree such that he resembled a rather scruffy looking feline angel clinging to the top of an undecorated Christmas tree. Only one solution remained, as Don could not go higher. "Do you want me to top the tree?" he yelled down. "Hopefully the lower limbs will break his fall" followed, which seemed to be based more wishful thinking than experience. Completely out of any reasonable alternatives, permission was granted. As the top 10 feet of the tree toppled, Gus Gus flew spread-eagled from his last retreat like a flying squirrel. He cleared all branches until his trajectory landed him on the lowest branches of the tree, breaking his fall. No doubt wide-eyed after the circus acrobatics, a considerably skinnier Gus Gus took off to the shelter of the underbrush 50 yards/meters away. My daughter gave chase and soon returned with a purring, though somewhat sodden, cat. Obviously, the ordeal had not caused serious damage. Don must have found it entertaining as he charged less than he could have for his services. However, what if he pulls that traumatized tree climbing prank again? Any suggestions? Our driver let out a muted groan as he was waved to the side of the busy Mumbai road by a police officer, one of a small cadre of uniformed men who stood at the intersection. We negotiated our way to the curb despite the motorized rickshaws, blue cabs, motorcycles and jaywalking pedestrians, all of whom were intent upon weaving their way through the midday traffic. Like well-trained dancers, the drivers slipped by each other, nosing out anyone who hesitated to completely occupy the road surface in front of them, lunging from lane to lane, and squeezing through impossibly narrow gaps with the nonchalant confidence of a matador. Chaotic choreography, each participant knew the game and his or her limits and potential. 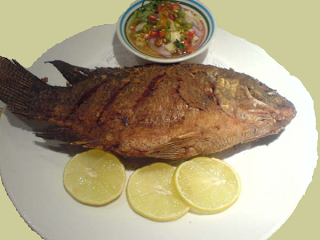 We had been making great headway through the crowded streets until plucked from the stream by the traffic cop, like a fisherman snags a trout and reels it into his net, thinking of nothing but the meal soon to be enjoyed. The crestfallen look on our driver's face foreshadowed the mini-drama that was to play out. He stepped out of the car to face the policeman, papers in hand. The officer, his sweat-soaked shirt evidencing the heat and humidity endured by his work, took them and headed for the shade of a small tree while motioning our driver to join him. At that moment, I was not sure who to feel sorry for; our soon to be ticketed driver or the underpaid policeman contending with the variable weather, ever present pollution, or the danger from aggressive drivers unhappy about being pulled over. The cop did a cursory inspection of the papers and the car while engaging in what appeared to be perfunctory discussion with our driver. Ten minutes passed. The fine for having the backseat privacy glass being too dark was 1200 Rupee (about $24). But the real problem was that payment of the fine would involve a time-consuming trip to the police station and potentially hours of bureaucratic hassle. 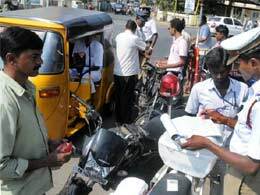 As was typical, the officer, needing extra funds to provide necessaries for his family, accepted the 200 Rupee ($4)offered by our driver in order to dispense with the ticket. It was a win/win proposition, and only the government, which quietly relied on this expedient way to backfill the impossibly low police pay, lost revenue. This was how the country functions in many ways I was told; systemic and seemingly irresolvable corruption. 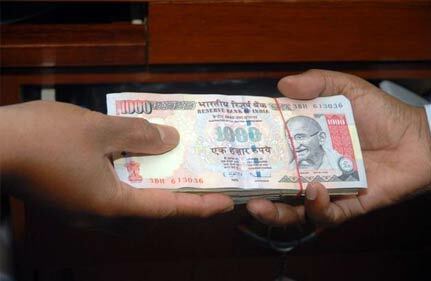 India's political and economic processes were rife with well-established kickback and payoff schemes. At higher levels, such corruption did not just enable the politicians and bureaucrats to make ends meet, as in the case of the traffic cop, but made them rich. We drove away from the small squad of police and continued edging our way through traffic in silence, except for the incessant sound of beeping horns announcing the presence of another vehicle or its imminent movement. No doubt my driver was mourning the loss of some of his profit for the day (given that my fixed cost for the eight hours was 2000 Rupee, about $40, including gas). My mind was struggling with what it would take for India's population to cure the incurable, fix the systemically broken and bring about change at an acceptable cost. It was then that my eyes focused on what I had been staring at, but not actually seeing, through the side window of the car. On the other side of the low wall of concrete that defined the edge of the overpass we were on was one of the many slum areas in Mumbai. India has more slums than any other country. From my vantage point it was nothing but a sea of corrugated metal rooftops, blue or orange tarps and stacks of garbage. While some degree of poverty was evident in most parts of this huge metropolitan area, the hopelessly poor who were found in these slums were tucked away and unknown to many whom even lived in city. I had asked a number of local residents about the movie "Slum Dog Millionaire", and how they felt about it. Many were disgusted by its portrayal of their city, arguing that the movie glamorized and popularized the slums of Mumbai while unfairly villainizing the rest of the city. Most of those responses came from people who despite living there had never been to the slums themselves. A few that I spoke to argued that the plight of those in slums was real even if fictionalized by the movie, and for that reason deserved approval. No one seemed to have an answer to address the symptoms of the poverty problem. Most seemed to think that it was hopeless, at least in the short run. In some ways, my time in Mumbai left me more troubled than other cities we had visited. Perhaps because it was bigger and more complex than many others. Or maybe it was because of the significant gap between the poor and the rich. Or it could simply be that this developing country, with the second largest population in the world, was facing such seemingly insurmountable challenges. As we drove on the clouds were gathering. The monsoons were overdue. 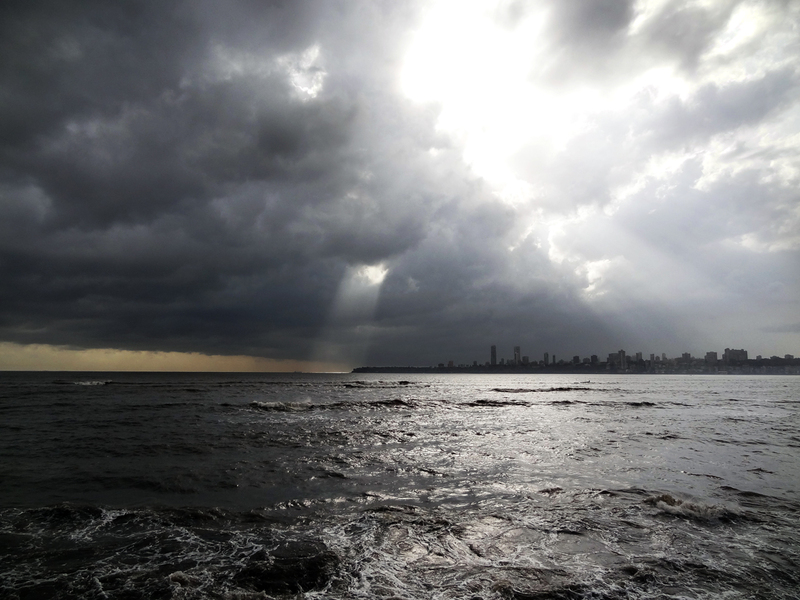 The city longed to be cleansed by the June rains. The new Cadillac Escalade was no more than 3 feet (1 m) behind our older model Toyota van when it started flashing its high beams as if urgently requiring us to vacate the lane in which we were driving. 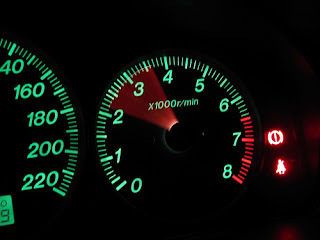 Although the speed limit is 120 km/h (75 mph), and we were traveling in excess of that, the pricey SUV had to use its brakes to avoid ramming into our rear bumper. Resigned, our driver pulled over one lane to the right on the six lane freeway so that the driver behind us could get by. I only caught a glimpse of the middle-aged man behind the wheel, but he was wearing sunglasses, dressed in the formal white Arab robes of a well-to-do Kuwaiti, complete with white head dress offset by a black cord to keep it securely in place. To add a further indication of importance he had a cell phone held to his ear with a hunched shoulder. He was clearly in a hurry, however it was doubtful that there was any particular reason for his speeding, except as an expression of his impatient and somewhat fatalistic culture. "Inshallah”, "if God permits" is an Islamic idea equivalent to predestination. That is, that since everything is in God's hands, including whether one will live or die, there is little to be concerned about. Everything is "Inshallah". But there are other, more modernistic, philosophies that dictate a similar cultural outcome. There is a saying I heard, attributed to a middle-aged Kuwaiti. "My father rode a camel. I drive a Mercedes. My son will ride a camel." This is present-day Kuwait. 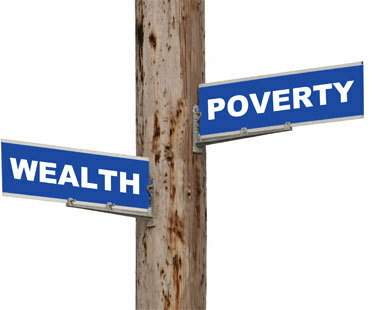 It is a land with disproportionate wealth (and a huge gap between the wealthy and poor). It is a place (similar to Dubai and other modern-day Arab cities) where the show of riches through architecture, expensive cars and decadent lifestyles goes with the territory. In fact, non-Kuwaiti residents exceed the indigenous population, mostly due to the need for construction workers, domestic workers, and businesses representing offshore interests. It is today's (and tomorrow's) oil money being spent as fast as possible. Many Western retailers and restauranteurs have set up shop in Kuwait (not just the ubiquitous McDonald's and Starbucks). Since virtually everything is imported (with the exception of oil), everything from foreign foodstuffs to fashion can be obtained there at a price. As opposed to many of the cities that we have visited, Kuwait City does not appear to have bustling streets filled with people walking to who knows where. Of course, this is primarily due to the weather. The temperature rose to 50°C (122°F) virtually every day, making time outside dangerous without the ability to rehydrate. Everyone seemed to carry water withthem no matter where they were going. Despite being on the Persian Gulf (or more correctly the Arabian Gulf), it is not muggy, but is a dry heat. It was not the heat that bothered me, but the cultural norm that dictated no shorts were to be worn outside that caused me to perspire much more profusely than necessary. 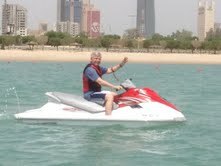 Frivolous as it may sound, one of the highlights of our time in Kuwait was the opportunity to jet ski on the Gulf. The country of Iran loomed on the shore opposite. The beaches were deserted for the most part, and there was very little water traffic, but I could imagine the port city being deluged with foreign troops and the waters dotted with warships just a few years ago. Almost everyone who is not a Kuwaiti but living in Kuwait anticipates the day they will leave, some longing for that day and others dreading it. Even some who have been there many years have difficulty describing this country has their home. Perhaps this is partly due to the fact that there is insurmountable difficulty in obtaining citizenship there if you are not born in Kuwait to a Kuwaiti. This leaves a further communal predisposition to a temporary view of life in Kuwait. The freeway flow of traffic was quite often slowed by the presence of a roadside wreck. It was usually a high-priced vehicle that had incurred very significant damage indicating that the accident had taken place at high speed. Each time I passed the twisted metal and shattered plastic of a smashed automobile I thought of the people living in Kuwait. I wondered about the similarities between them and people with Parkinson's disease. Tomorrow may hold its uncertainties. Today is all we have. But living life with fatalistic, pedal-to-the-metal recklessness or fearful, pumping-the-brake in anticipation of tomorrow seems to miss the point of living at all. Surely there is purpose that captures our passion, a faith that defeats our fears and significance that defines a more satisfying reality than just living for today. Both of the boys were born and raised in the country. Farming was the family's mainstay, supplemented by other means of earning income. Both young lads grew up enjoying soccer, playing with friends and exploring. But despite the similarities, their lives could not have been more different. You see, I was one of those boys, raised in an apple orchard in the beautiful Okanagan Valley of British Columbia, Canada. 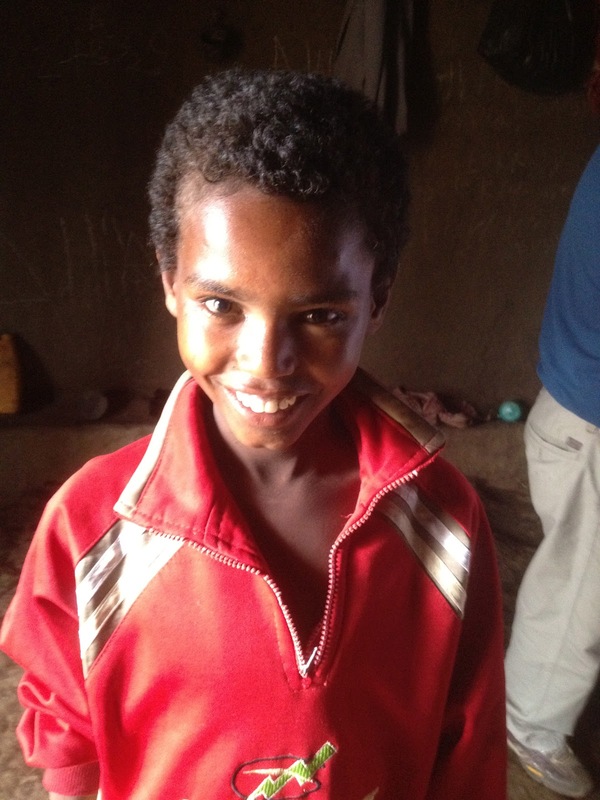 The other boy, Abdisa, now 11 years old, was growing up in a small village in rural Ethiopia, where he, his mother and siblings live in a mud-and-manure-caked home built out of sticks. Abdisa is a World Vision child sponsored by my family whom I had the privilege of visiting while in Ethiopia. Abote is a village located off a gravel road approximately 3 hours north of Addis Ababa. I had asked numerous Ethiopian people where this village was, but no one seemed to know except the local World Vision staff who took us there. It was obvious when we arrived in Abote that white visitors are not a common sight. After a short briefing at the World Vision compound, where the dedicated staff work and live in order to serve the struggling community, we drove to the edge of town where Abdisa lived. It was obvious from the huge smile and enthusiastic greeting (three kisses on alternate cheeks) that Abdisa's mother was very pleased to see us for the anticipated visit. Abdisa himself, and his brother and sister, were somewhat shy and reserved until our visit became more comfortable. We were invited into the small house that had been constructed by Abdisa's mother, and of which she was very proud. It had been made possible due to the fact that World Vision had through a micro-finance program been able to loan her money, which she used to engage in trading that the local market. It was made of sticks gathered from the surrounding area, inserted in the ground and then woven so that the windowless walls stood about 2 m high, making a 3 m x 3 m square. The stick walls were then covered in a mixture of mud and manure that had hardened, and the floor was made of the same mixture, but remained somewhat soft. Seating and sleeping was accommodated on a mud/manure ledge around the perimeter a few inches off the floor of the small room. The family's belongings were hung in plastic bags on hooks around the room. The only modern device in the hut was a single lightbulb. Cooking and other domestic chores took place in a small, covered area next to the home. After some initial introductions and speeches, I gave Abdisa the gift I had purchased for him, a soccer ball (together with the pump to ensure it would not become useless upon deflation). He lit up with a smile, his dark brown eyes sparkling, and like any boy his age immediately wanted to play. While Abdisa, his siblings and friends (a crowd having gathered), and I kicked the ball around the small yard, his mother disappeared into the cooking shelter, stoked the fire, and put on a kettle in which to make coffee. She had insisted that we stay, and we were compelled not to rebuff her hospitality despite the fact that we were well aware she would be using supplies that had been expensive for her to purchase. Having displayed my excessively rusty soccer skills with Abdisa and his friends, I retreated inside to enjoy some very strong Ethiopian coffee, complete with a significant helping of sugar, which had already been added. In addition, she passed around a tray of round, flat bread, a piece of which we all took and ate. The remaining bread she freely gave to all those that had gathered to observe this unusual occasion. Surprisingly, I was not overwhelmed by the poverty, the simplicity of life for Abdisa and his family, nor the lack of what we would consider necessaries. What brought tears to my eyes was the happiness evident in Abdisa’s mother's face, the relative contentedness the family seemed to share, and the appreciation they expressed. Despite their marginal living circumstances, they expressed no greed or sense of expectation. In fact, while we spent approximately 5 hours in the village, exploring the work that was being done by World Vision, no one approached us to beg or ask for anything, not even children wanting candy or money like in the city. 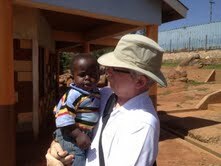 Carson and I were moved to do what we could to improve the lot of Abdisa's family. So, for a relatively small sum, we were able to purchase a goat for them to improve their farming self-sufficiency, as well as a new pair of sandals to replace Abdisa's obviously worn-out footwear and money to enable a bigger loan through the micro-finance process in order to provide Abdisa's mother with more capital to make more money in her trading business. It was a small thing to do (under $150), but we believed it would make a difference in their world. As we left the village that day, driving to our overnight accommodation back on the main highway 30 km from Abote, I thought about my own childhood and how it differed from that of Abdisa. I had experienced and been provided so many opportunities. So many people had contributed to making my life relatively easy. It was not just the relative economic disparity, but the attitude appreciation I found in Abote. Somehow, Western society (me included) has become rich, and yet prone to complain and be unhappy. At the same time, Abdisa and his family have accepted a hard life of relative poverty without grievance. Why is that? There is something about a city that has no stop signs that cries out for comment. 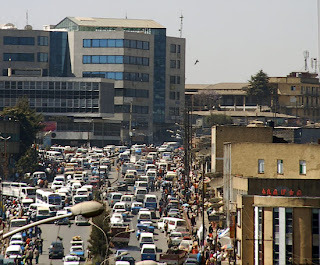 Addis Ababa, Ethiopia, is one of those cities. 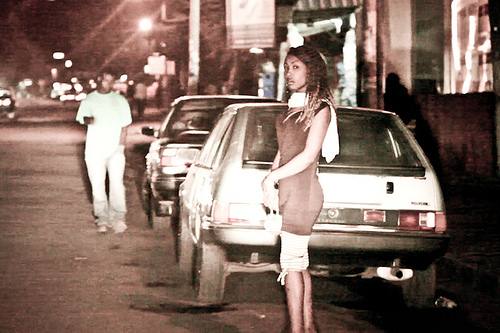 To make matters more complicated, Addis has only a handful of street signs. This leaves traffic, pedestrians included, to their own devices, with a multitude of strategic decisions to make when navigating their way through the innumerable avenues and alleyways of this sprawling city. Sidewalks and streets are in various states of disrepair, although they are generally paved (a relatively new phenomenon apparently). 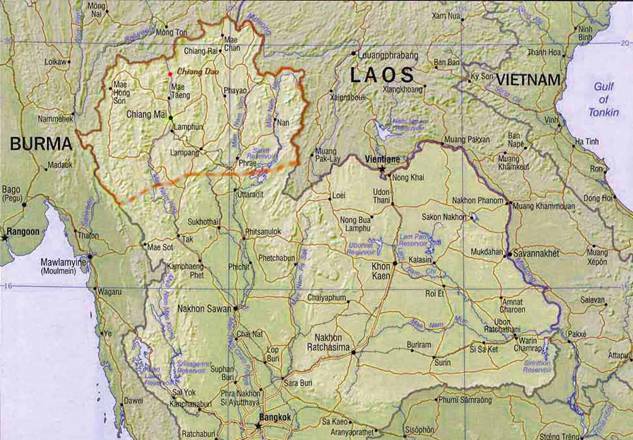 With a population of somewhere around 4 million people (no one really knows), it has the distinction of being the world's largest city in a landlocked country. Add this all together and you have a lot of people who are essentially trapped, not sure where they are going but who are impatient to get there. 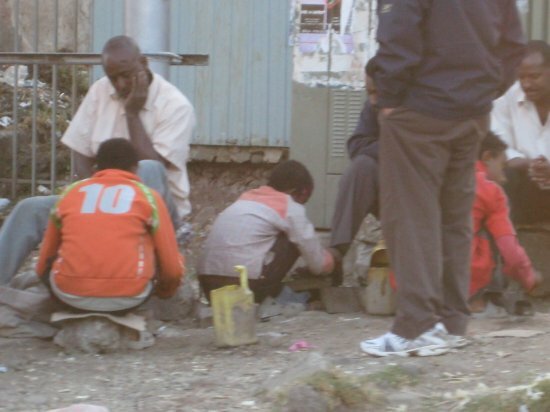 During the day one is struck by the number of shoeshine entrepreneurs occupying each block. Beggars are common, and hawkers of almost any kind of goods are persistent in many places. At night the same sidewalks may be occupied by provocatively dressed hookers who appear entirely out of place in this basically conservative environment. Construction is occurring everywhere, with modernistic, new buildings pushing into the cityscape alongside ramshackled, old structures. It is not unusual to see herds of goats being driven down a main thoroughfare, claiming the right-of-way from the innumerable taxis. It is difficult to avoid observing the city's incongruous and confusing mixture of culture, religion and controls. We arrived after a long day of travel only to find that our accommodation, a modest bed-and-breakfast, had confused our reservation. 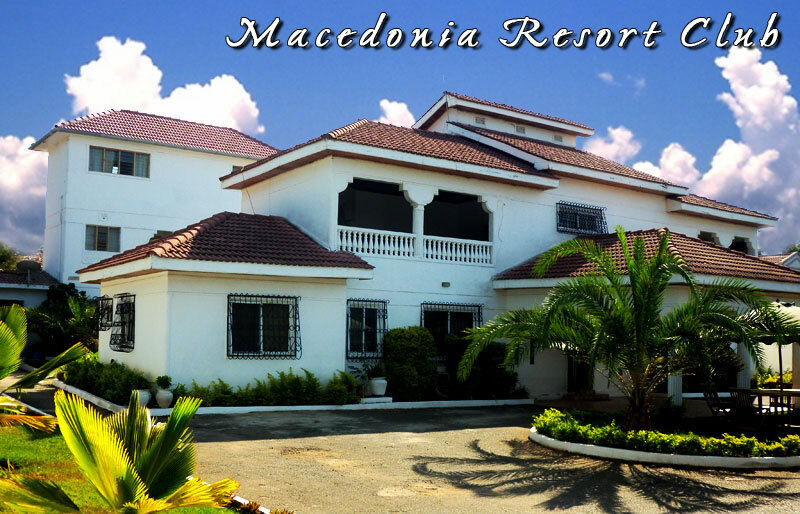 We always reserved on the basis of one room, two beds and Internet accessibility. We assumed that a shower would be available in each room we booked, however, in several cases this involved a bathtub and a handheld shower nozzle (making it somewhat difficult to keep the remainder of the bathroom from being drenched). Our accomodation reservation in Addis Ababa seemed to have hit a snag. Two rooms showed as being required (therefore doubling the price). However, after arguing, mostly in sign language and broken English, the problem was solved by the night clerk setting up a rollaway bed in the room, bringing the total cost down from $140 for two rooms to $95 for one. Despite the somewhat reluctant negotiated late night compromise, we received a call from the manager the next morning advising that it was against the law to allow two non-Ethiopian man to sleep in a single room. The rather bold assumption and double discrimination were troubling but seemed irrefutable. However, skillful negotiation on Carson's part made way for an exception in our case based upon my apparent need for 24-hour attendance by DOCTOR Pue due to my Parkinson's disease. While Addis Ababa is anxious to greet the Western world, it appears to be doing so at somewhat of a pell-mell pace and piecemeal fashion, tripping over itself in the confusion of cultures, the desire to advance and the shrugging off of its reputation as a famine-plagued, have-not country. One evening for supper we attended a traditional European restaurant with cultural entertainment in the form of singing and dancing. Although the ancient instruments and historical music were fascinating, it was difficult to avoid the fact that very loud amplification, technical sound enhancement and computerized musical support was utilized throughout the show, despite the rather small audience of 30 or so patron. Racing away from the past and into the future inevitably means that some things and some people are left behind. The city's landmark-based navigation requirements and almost total lack of regulated traffic are indications of this anomaly. The fact that almost everyone seems to have a cellular phone presents a visual contradiction to the evidence that the country is continuing to struggle with poverty, corruption and economic challenges. It is, after all, the city with no stop signs. 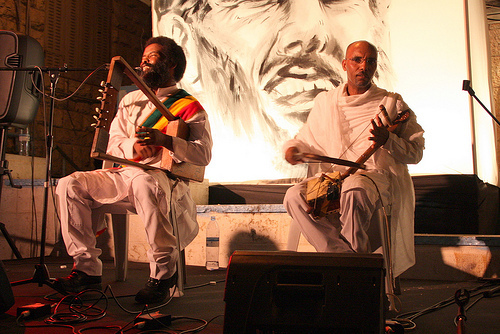 In Ethiopia, when someone has tremors, an observer might draw one of two conclusions. The first is that the shaking is caused by withdrawal from alcohol (in some places called delirium tremens). The other assumption drawn from such a sight comes from an Ethiopian saying, "He who is shaking has killed a cat". Wolde was certain that neither was true of him, despite his tremors. But the idea of identifying the cause of his Parkinson's disease as being based in something as simple as having killed a cat brought a smile to his lips, and mine, as he spoke comfortably about his diagnosis a little over a year ago. 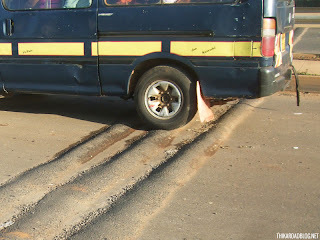 Wolde had been a mechanical engineer with the Ethiopian highways department before his retirement. Not wanting to be found idle, he volunteered as a logistics specialist with World Vision, assisting large numbers of needy people in his home country. Despite having left those responsibilities behind, he assured me that he kept active, both physically and mentally. Regardless of his 76 years, he understood that this was important to maximize the quality of his life with Parkinson's. We met in a modest second-floor restaurant in the southeast quarter of Addis Ababa where he and several of his long-term friends met every week. They had done so for years to enjoy each other’s company, reminisce, talk about current topics of concern, share their common passion for the work of young people and leaders in their respective circles. Wolde drank a macchiato, and I sipped on my Ethiopian coffee, served in a demitasse with several teaspoons full of sugar as is done everywhere throughout this country. I loved the coffee, but struggled each time to get the tiny, scalding hot, full-to-the-brim cup to my lips without leaving a dark stain down my shirt or scalding my tongue. Despite our age difference, life experiences and the fact that I was from a culture and a city at least half a world away, we spoke as friends who shared a not so secret disease. Wolde had been diagnosed incorrectly several times before finally being told that he had Parkinson's disease. It had struck him hard, as it does most people, but he quickly regained his equilibrium and now remains positive despite the prognosis. Astonishingly, despite his large number of friends and contacts, Wolde was unaware of anyone else that had Parkinson's, and knew of no association or organization that works to support people with PD or improve their lot. He was certain that "nerve doctors" would know of some, however, he himself had been diagnosed by a general practitioner, who prescribed carbidopa levodopa in basically the same dosages as I take. I asked him how he stayed positive? He was quick to tell me that his faith, being a longtime member of a local Protestant church in Addis Ababa, was a key for him. He said that he did not understand how people without a faith in something bigger than themselves, bigger than science and bigger than people generally could manage remaining positive in the face of serious disease. He did not consider his faith to be a crutch. Rather, his beliefs constituted the core of who he was, and they simply became stronger when confronted with the challenges of the disease. This was not all. He was obviously in tune with at least some of the aspects of self-care that might alleviate or slow down some of the symptoms he was experiencing. Since his diagnosis, he had begun taking certain vitamins and was doubly committed to remaining active, reading, doing puzzles, getting exercise, and generally using all of his faculties to their fullest potential. After an hour of interesting exchanges, I thanked him for his time (trying my best in Amharic (the primary language in Ethiopia, although there are some 80 others), "Ama seh geh neh lu’ (thank you very much). He answered, “Chigger yellem” (no problem). I gave him my Positively Parkinson’s card and he sincerely wished me well with the blog and seemed keen to follow our continuing journey. As we parted, we firmly shook hands knowing that, despite the short time together, we had become friends. “No more killing cats now”, I said. "Trainee" the lapel name tag read. But despite the label, the young woman at the front desk of the Sarova Game Camp who assisted us in gaining Internet access exuded confidence beyond her stated position and apparent age. From time to time on our round the world journey we have had the opportunity to encounter people who, without intention or design, stand out for some reason or other. They consistently sparkle while the rest of us simply struggle to shine on occasion. 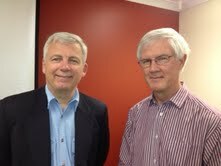 It is as if they are called to be key participants in significant stories being written and lived out at the same time. Sometimes, these men and women are recognizable by their demeanor, the manner in which they observe others around them or carry themselves when interacting in a group. At other times it is the words they use, the unrehearsed expressions that evidence an unusual wisdom, or the insights and depth of understanding they gain while listening to others. Simply put, some people we have had the privilege of meeting are extraordinary. The name of the "Trainee", as it turned out, was Peninah. Her English was excellent and she proved very helpful in our establishment of the necessary computer connectivity, while at the same time allowing us to quiz her on progressively more personal topics. What was she training to be? What did her training involve? What sort of education did she have? Where did she come from? What did her name mean? It turned out that Peninah’s mother had given her a Hebrew name from the Bible. It means, “pearl", something of great value that started as a mere grain of sand but by provocation created the unimaginable. Yet, she was a Masai, born and raised in the Masai village only a few kilometers away from the Game Camp. Each day after her shift at work she returned to live with her family in the traditional Masai hut, a likeness of which is shown below. That, in and of itself, seemed extraordinary. How could such a well-spoken, obviously intelligent, young lady working her way into the hotel management business, live fully engaged in an apparently outmoded culture. The Masai have notoriously shunned modern world ideologies and maintained their traditional practices and principles despite attempts by governments to convince or coerce them to abandon them. You see, the Masai have been for centuries brightly dressed herders of cattle, and have historically lived almost exclusively on a diet comprised of the products of such livestock. While not compliant with most modern theories of dietary balance, they tend to live longer and suffer less disease than many of their countrymen. They used to be notorious cattle rustlers based on their belief that all cattle had been given to them by God. Now they have become shrewd cattle traders instead, achieving larger and larger herds with constantly improved stock, all of which has created demand for more grazing territory, and the resulting conflict with the authorities. It has become a confrontation between the ways of the Masai warrior and the surrounding cultural juggernaut. Rather than being caught between two opposing worlds, she has learned to accommodate both. She respects and largely shares her family's community values while understanding and adopting the necessary aspects of a larger worldview. But that is just beginning. As intimated by the name she was given by her mother, Peninah has chosen to accept the tensions between her own Christian faith and the naturalistic traditions of her extended family. But there is yet another cause for conflict: education. It is unusual in the extreme for Masai women, who live in a male elder government community and play an important role in the life of the community, to leave their family and pursue an education. Peninah did both. She completed a college degree in Western Kenya. It seems that the extraordinary people we met in our travels these past weeks share some attributes. First, they have the vision outside themselves, and ability to see beyond what is, to what can be. It is a picture they carry in their hearts and minds, a vision of a better tomorrow. Secondly, they have a passionate commitment to pursue that vision and make it real. Peninah has such vision which she is passionately pursuing. It is to preserve the culture and fundamental principles of her people, while at the same time promoting the benefits of education. Such pursuits present enormous challenges. But there is fire within that small frame of Peninah. And we have no doubt that although she is just a mere trainee at present, she will someday live up to her name and be recognized as a pearl of great value. It was 7 AM. Joe had just arrived to pick us up from the palatial Sarova PanAfric in Nairobi, the nicest hotel we had yet stayed in on our trip. We were awake early, despite having arrived late the night before from Kisumu. Although somewhat groggy, we were ready for the five hour trip to Maasai Mara. The next few days were our third, and final, planned tourist activity (Machu Picchu and Kruger National being the other two). We had anticipated using the long road trip time to catch up on sleep, but failed to take into consideration the road conditions. Joe had often driven this route, and did his best to avoid potholes, speed bumps and hazardous traffic conditions, but could do little when faced with the road (or off road) conditions for the last 125 km. Having suffered under the heavy rains recently, there were many sections where the road was intersected with gullies 2 feet deep, threatening to high center Joe's Toyota four-wheel drive van. But, undeterred, we bounced along for several hours learning to trust his seemingly innate ability to miss the worst of the large rocks, mud-filled potholes and water-made ravines, all the while passing any other vehicle in his way and traveling at speeds normally attempted only on smooth pavement. Preferring to die with our eyes wide open, we abandoned the idea of catching up on any sleep. Sore from the ride, we arrived at the gates to the world famous Maasai Mara nature reserve only to encounter yet another irony in Kenyan culture. The entry fee was $70 per day per person, meaning a total of $280. Cash. US funds. Why would Kenya's premier tourist attraction charge in US dollars. This seemed to constitute a distinct lack of confidence in the country’s economy or currency. Despite having expected to pay in Kenyan shillings, Carson scraped up two $100 bills and I had enough smaller bills to satisfy the gate authorities. 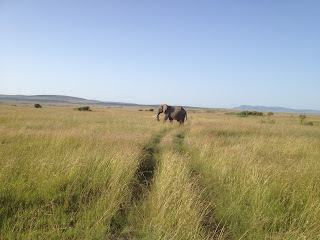 Joe then delivered us to our accommodations at the Sarova "Game Camp", inside the Reserve. The Game Camp was really a very well designed resort with a pool, mini golf, eating and drinking facilities, all snuggled in a densely treed area alongside a small creek. Our "rooms" were in fact tents. 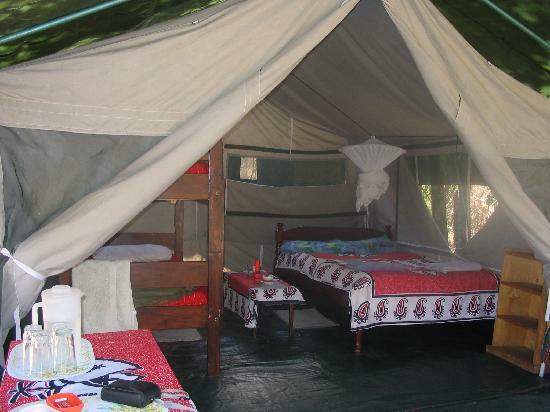 These are not ordinary tents, but ones with hardwood floors and attached fully functional bathrooms with all of the necessary amenities. But before we settled in, Joe returned in something of a panic. There was a problem with the $100 bills. 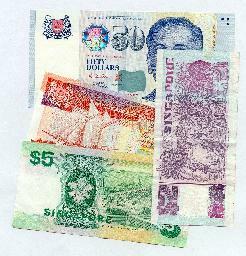 With visions of our experience in Peru, we thought at first they were found to be counterfeit. Joe explained. Apparently, neither banks nor any businesses in Kenya accept US hundred dollar bills older than the year 2000. No one seemed to be able to explain why. Here we were with no US dollars, and a five hour drive away from the nearest bank in Nairobi where we might be able to get US funds (although it was Independence Day and they weren't open anyway). Fortunately, after another 24 hours of negotiating on our behalf, the Game Camp management and Joe reached agreement with the authorities at the entry gate. We were allowed to pay in Kenyan shillings at a slightly inflated conversion rate. Disaster was averted. When we had booked Maasai Mara some months back I had had mixed feelings about going to a second game reserve, both in Africa. This concern had increased because Kruger National had been such an extraordinary experience. But I was told by reliable sources that it was worth the trip. I was still skeptical when we headed out with Joe on our first of three game drives. But I was immediately reassured when I noticed that the “feel” of Maasai Mara was totally different than Kruger. In Maasai Mara there were no paved roads, densely vegetated areas, or posted speed limits but rather unpredictable, off-road tracks traversing wild, wide-open hilly savanna grasslands, which Joe drove through as fast as possible (reaching speeds of over 90 kph/55 mph). You could see for miles around you and I wondered how we would ever get close to any animals. This was compounded by the fact that the rains had resulted in the grass growing to 3 or 4 feet high, easily hiding all but the elephants and giraffes. 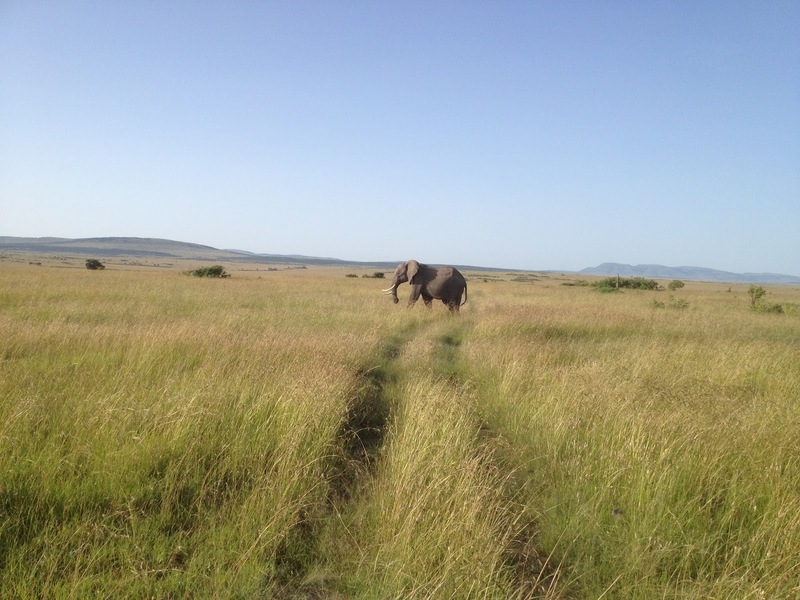 Although very different, the Maasai Mara proved to be the equivalent of our Kruger experience. Not only did we repeat seeing the Big Five (leopard, lion, elephant, buffalo and rhinoceros), we were actually close enough to touch several prides of lions. But even more rare and awe-inspiring, we were able to follow a pride of male lions on the hunt, watching them strategize, stealthily approach their quarry. They had observed the lone Cape Buffalo with its small calf from a distance of several kilometers, and began moving quickly but carefully through the deep grass. We followed at a respectful distance of twenty meters or so without the lions so much as glancing our way. They were intently focused on their prey and ignored us entirely. It was not until the lead lion was 50 m away that the adult buffalo realized its danger, or more precisely, the precarious situation of the young calf. At first they attempted to escape, but were quickly cut off by the four big cats that had surrounded them. The adult Cape Buffalo, protecting the young one who stayed as close as possible, turned to face the hunters as they each sprang in turn depending on which way the death-dealing horns were facing. Had it been a battle between the buffalo and one lion, or even two, it might've been a different story, but in this case, barring a miracle, the end was certain. Despite a valiant effort, the adult buffalo, facing down three of the lions, was soon separated from the young calf, which was then dragged down by the remaining lion. Seeing the young one disappears into the tall grass, the adult buffalo seemed to recognize the hopelessness of any defense and began running, chased by only one lion this time. It seemed that the pride were not keen on a bigger prize, but had somehow determined in advance that they would be satisfied with a small victory. We were only 10 meters away while we watched the consummation of the kill for a short while before turning to make our way back to the Game Camp. It had been a dramatic but sobering sight as we recognize that the reality of this world must include a victor and a vanquished. As I fell asleep that night under the shelter of a canvas roof, protected by my mosquito net and otherwise feeling secure despite the innumerable noises of the night, I could not but contemplate how my reality was so different from much of the rest of the world. In some ways my own struggle with Parkinson's disease, supported as I have been by every medical privilege, is not much more than a small dose of reality. Yet PD is enough to demand an answer to a question that others in my Western culture may not yet have been directly asked: "By what principles will you contend with reality?" 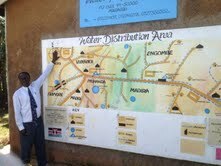 Wherever we went in Western Kenya we saw children walking to and from school, most dressed neatly in school uniforms. In fact, my observation was that even the poorest here seem to do their best to dress in clean and presentable clothes. Despite the heat that I felt, the locals thought that it was cold and the children and adults alike all wore sweaters, long sleeve shirts and even winter coats. It is difficult to get over the irony of being at the equator and watching people complaining about the cold. Of course, I did my own Parkinson related "shivering" due to stress of a heavy travel schedule, sleeping in a new bed most every night, missing my nap in the middle of the day and, perhaps most importantly, dealing with the constant barrage of "newness". Traveling, especially into areas of the world that are different than anything you've experienced before, can be exhausting. After more than a month on the road I am feeling the effects. Hopefully, this is not the forerunner of some illness, but just a reminder that people with Parkinson's need to be of very aware of the disease-caused limitations (without being a slave to them). Our interest in going to West Kenya was, in part, to see the work being undertaken by Hands-On Development Initiatives International (HODI), a small charity operated in large part by a Kenyan family with links to British Columbia. We got to know a little bit about this work through Jarvis, a member of this family, who is also a fellow student and a friend of my daughter. In fact, we were met at the airport by Jarvis's father, who also has made arrangements for accommodation and transport is to be community where HODI carried out most of its activities. Of course, getting there was an adventure in itself. As was typical in rural Kenya, the roads were obviously not a priority. However, this did not seem to slow down any of the local drivers, who barely missed pedestrians, livestock, and other vehicles by a few inches/centimeters. In a number of respects, HODI, has adopted the home village of Jarvis's family, Muhanda, located approximately one hour away from Kisumu. 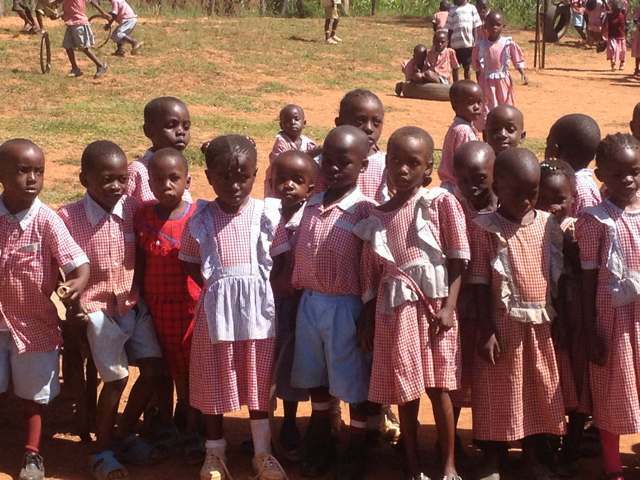 Upon arriving at the preschool, built and operated through the efforts of HODI, we were greeted by approximately 150 preschool children between the ages of 3.5 and 6 years old, all dressed in uniform. Led by their teachers, the kids sang a queue songs in English, most of them with enthusiasm and smiles. Having spent a portion of the morning observing the teachers and children, it was obvious that this was a good work, benefiting the children by feeding, educating, and providing an encouraging environment for their growth and development. Were it not for this school and its programs many would go hungry for the day, lack the preparatory work some of them need to engage in primary education, and, perhaps most importantly, live in unhealthy circumstances that discourage personal development. Speaking with the teachers, it was obvious that they are passionate about helping the poorest and most helpless children. This took the full child into consideration. For one child, it led to a constant battle between the teachers seeking to treat that child's "jiggers" (a type of flea found in Kenya and other countries, which burrows into the skin and causes infection, particularly of feet), and his unsanitary home environment where the situation was being re-created or worsened. The picture shown above was not staged, but simply resulted from the taking the initiative to pick up one of the smaller ones (whom, I learned later, was also one of the most underprivileged children coming to the preschool). The second project that we viewed was a water project that supplied a significant portion of the village with clean (chlorinated) water to their homes, some schools and other establishments. Without this system, the supply of water (not necessarily clean) within some distance away, requiring transportation by hand. This system was built by HODI with the assistance of the community, and is now owned by the community through its own user-elected Water Committee, which ensures that the system is fully functional, modified where required, and that the amount users are charged (assuming they have the means to pay) is fair. Two other HODI projects are either in process or just beginning. There is a medical clinic that we visited, where expansion is installed due to process and funding. We saw how the existing clinic premises were full, with at least 30 or 40 people lined up to see the one doctor. 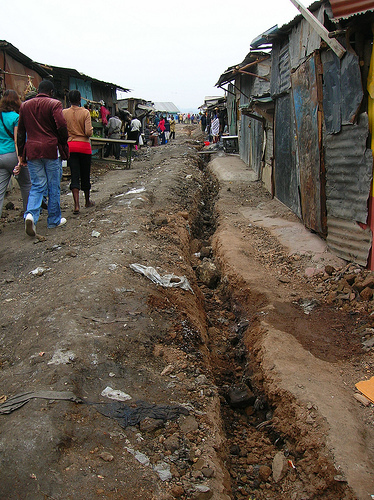 One project that was just beginning, in terms of construction, was a community-oriented micro-finance concept. This involves the construction of a small dairy facility, housing several milk cows, with a rabbit hutch mezzanine and biogas facility to be added later. This is all next to the school property , which has attracted a lot of the students' attention . 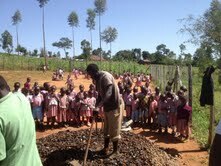 The foundations were being dug, and the simple type of mud/rock concrete "poured", the morning we were there. Other than shovels and one wheelbarrow, the two barefoot laborers and a "foreman" (who was actually the pastor of a local church congregation) had no tools whatsoever. In fact, the whole time we were in West Kenya I saw no more than one or two pieces of farm machinery or other types of equipment. Mechanization is a luxury in this part of the world. Hard, back breaking long hours of labor with inadequate tools and equipment are normal here. What struck me strongly about our visit to the western parts of Kenya, and particularly the HODI projects that we saw, is how much can be done with so little. This is as opposed to North America where so little is done with so much. I wonder, have we in the developed world forgotten the lessons that were taught to us by our ancestors and that made our countries what they are? If so, what are the consequences? Speed bumps were placed somewhat indiscriminately upon the main highways and secondary roads. It was obvious that these were not planned for protection of pedestrians. Their most common function was to test the vehicle's nonexistent shock absorbers, tire pressure or the weight of passengers or cargo being carried. In most cases, these traffic control devices were so severe as to cause each vehicle to slow from its typical right next speed to a near stop, before speeding off again. 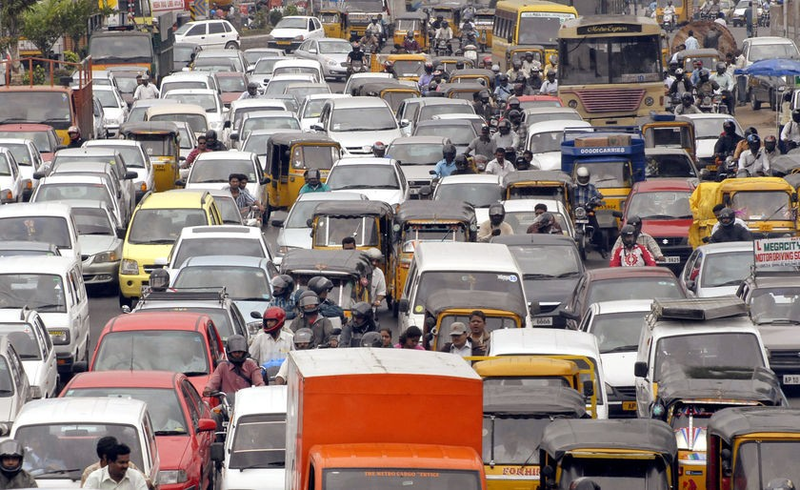 As in many other cultures, automobiles come first and have the right-of-way, often missing the many people walking on the shoulder of the highways by inches. Even on the modern thoroughfares, of which there are a number, cutting in front of other drivers, tailgating and driving far beyond the mechanical safety margins of the vehicles are all part of normal everyday traffic congestion. Of course, all of this is slightly more disconcerting to North American visitors, given the fact that Kenya is a right-hand drive country (like South Africa). Since arriving in Kenya it has been difficult to get a grip on which is the real Kenya. It is a country, like others in Africa, with an abundance of contradictions. 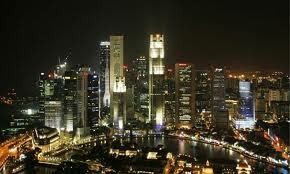 It has incredible beauty, and some extraordinarily modern commercial and residential skyscrapers. Yet urban housing for the poor often consists of little more than a small, tin shack or mud and sticks structures with none of the basic services available. Despite being equatorial, it is green in many places, yet struggles with supplying many of its citizens with the basic requirement of clean water. Education and healthcare can often be out of reach for the country's poor, thereby condemning them to shortened lives, and a lifelong search for meaningful and remunerative work. Yet there is a thirst for knowledge that drives young people who will form the future of this country. The country's capital, Nairobi, is proud of its multinational company offices and modern technology, equal to many Western cities. Yet the rural population ekes out a living farming small plots of land or working in tiny shops that make minimal profit despite working long hours. Our experiences with the contradictions that make up Kenya were numerous, commencing from the moment we first arrived. Despite being the hub of this East African country, the Nairobi International Airport lacks any of the polish of an international point of entry. On the other hand, Kisumu International Airport is modern, efficient even though it is small (only 3 gates) and, despite its name, has no international flights arriving or departing from its facilities. On a side note, the Kisumu International Airport does have one of the best bookstores we have encountered, despite the fact that it is no more than 10 ft.² (3 m²). Next, there was the comparison between the Macedonia Resort Hotel in Kisumu, where we stayed our first night, and the Sarova PanAfric Hotel in Nairobi, where we stayed our second night. The former, while clean with friendly staff, was a colonial style building with some difficulty in living up to its name "Resort". However, it was the least expensive of any hotel that we stayed at. Despite the power outages during a rainstorm, and the total lack of functioning Internet connection, we felt comfortable and welcome there. 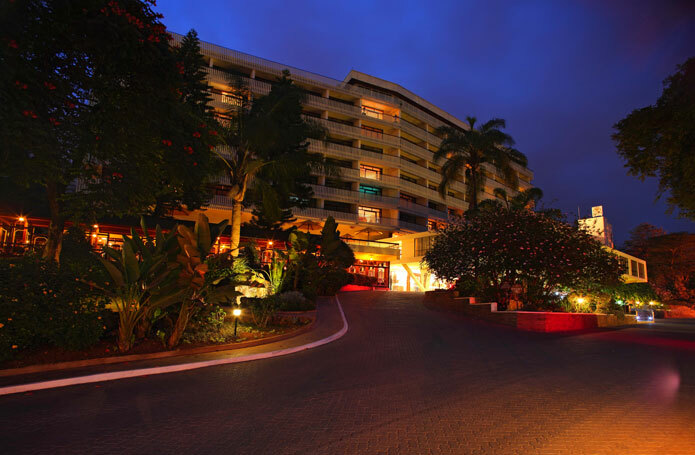 On the other hand, the PanAfric was an elite hotel has the distinction of being the most expensive accommodation thus far. While the staff was very service-oriented, we had the impression that tipping a few American dollars somehow inadequate. The meals served by both hotels were further indications of their differences. The tilapia had the Kisumu hotel was fresh caught from Lake Victoria, deep-fried whole and eaten with one's hands (while we studiously avoided looking into the unblinking eye of our evening meal). We were the only people in the restaurant, and our server, as well as cook, checkout clerk and, we expected, maid, was a friendly, simply dressed lady by the name of Teresa (she told us, as she had no name tag). In the Nairobi high-rise hotel, there was every type of international cuisine available in the busy hotel restaurant. Served by efficient, uniformed waiting staff, the meal was delicious, costing quadruple the price of the prior evening's supper. As always, there seemed to be lessons any alterations made. It is not just Kenya it finds itself in contradictory states. Certainly, in my case, my personal contradictory behavior has become all too evident. For instance, there are times when my Parkinson's tremor is something I want to hide so that I can fit in and avoid attracting the sidelong glances of people trying to define my particular malady. In other cases, I would not apply for a Handicap parking sticker, yet I have been quick to take advantage of my "disability" to gain advantages, such as proceeding to the front of long airport lines. People, generally, are guilty of judging the contradictory elements of both individual and cultural behavior. However, speaking for myself, there is little doubt that I have their some responsibility for my own hypocrisy.